I have given myself the challenge of trying to create more order in my life. There are areas where I manage well and others where I fail dismally and cause me stress. I would love nothing more, than to have routines and habits that enable life to just flow better. I am hoping that by posting everyday the various areas that need I feel improvement, that it will keep me accountable and I will achieve my to do list for once in my life. Today, and for the rest of the week, I will be focussing on the evening routine. If you follow any blog that covers home making as a theme, such as FlyLady, you will see that an organised morning starts with an organised evening. I personally have found that when I’m organised in the evening, my mornings flow much better. My evening routine has fallen by the wayside, as by the time I get to ‘arsenic hour’ (though to be fair- my children have graduated from THAT age group), my Plantar Fasciitus is playing up. Besides making walking painful, it drains my energy and saps me of positivity. I hadn’t realised just how much it was affecting me until last night, when I had energy, felt super positive and so scrubbed my kitchen! As I write this post, I am sitting in a hospital waiting room, hoping that my PF is going to be a thing of the past. So what are our evening routines? They may learn the value of being organised the night before. I have used my ‘Easy Peasy Chore Chart’ for the last two years. I love it. 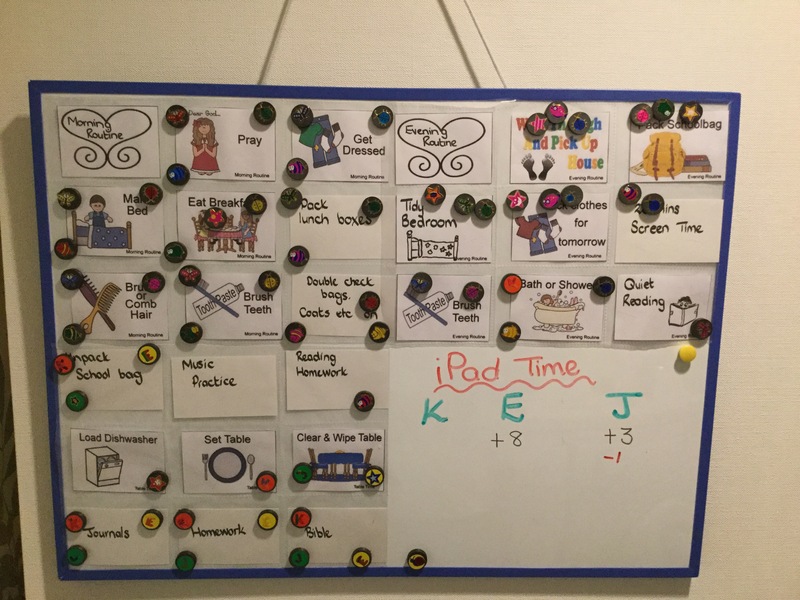 When I made it, I bought trading card sleeves, magnets and some stickers from the ¥100 shop, a large magnetic white board from a homewares shop, printed off the chores and hey presto- an instant chore chart that the kids love! My son has been using it since he was 2, using the pictures to help him to know what to do. It has definitely helped in teaching them what they need to do as part of their routine in the evenings and when I enforce it, the house generally looks quite neat in the evening when hubby returns home from work. If you would like to buy an electronic copy, please click here and you will be transferred over to their site. My evening routine isn’t linked to a time. I aim to start at about 10pm, with my light out by 11pm. Realistically, it usually takes me a bit longer (as I get suckered into some sort of game on my iPad) and I generally start later than planned. Ideally, I would like to start at 10pm and lights out by 11pm! In between doing all of these, I like to make a cup of tea for myself and hubby for us to enjoy while we read in bed. Here’s to 5/5 this week! This post contains affiliate links. This means that by clicking on the links and purchasing the products, I will receive a small commission. Thank you for your continued support. 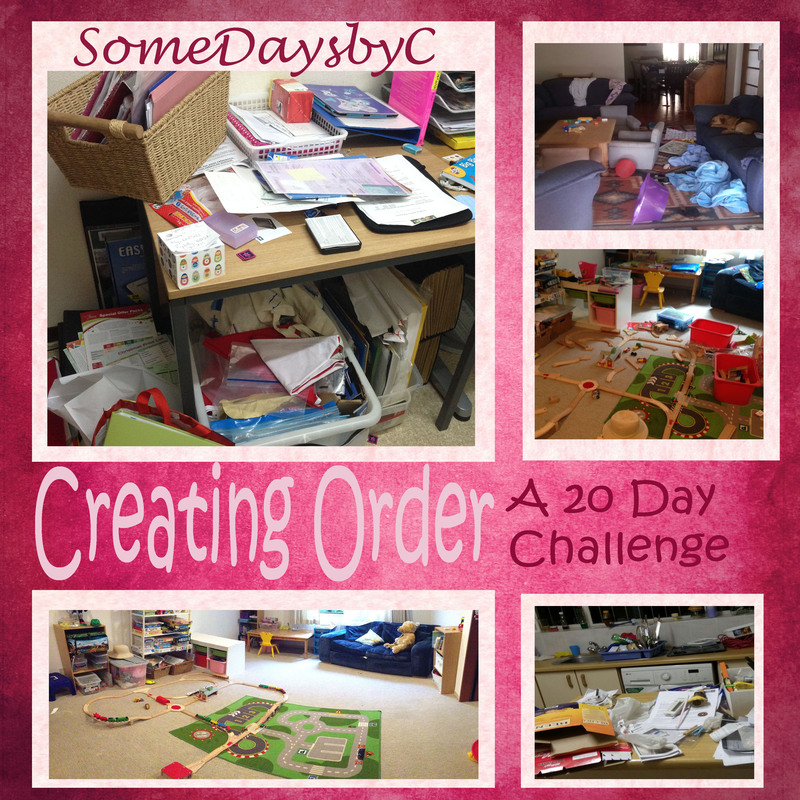 This entry was posted in Creating Order- a 20 day challenge, Good days, Growing as a person, Series and Challenges, Somedays and tagged depression, easy peasy chores, getting organised, routines. Bookmark the permalink.